We’re kicking off week No. 4 of our buttercream series with a dessert that’s as fun to eat as it is to make: cake push-up pops! Let’s put the pieces of last week’s deconstructed cake back together to create something that’s even more exciting and versatile. 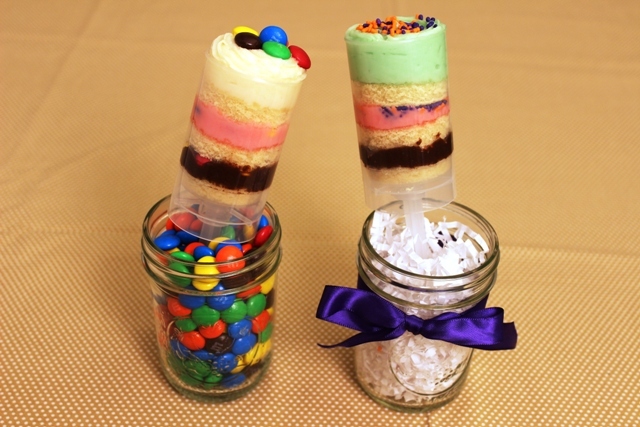 Clear push-up pop containers give you the creative freedom to put your beautiful layers of cake and buttercream icing on display any which way you like. You can fill them with a rainbow of different-colored cake and frosting, and you can make a beautiful DIY stand to serve them to your guests on any occasion. Just follow these super-easy steps and you’ll have a personal-sized dessert that your friends won’t be able to keep their hands off of! Get a ready-made pound cake or Bundt cake in the flavor(s) of your choice and cut it into 1/2-inch thin slices. You can also use a store-bought cake mix to bake a thin layer of cake in a jelly roll pan. Use the push-up pop container to cut out small, thin circles from the cake. 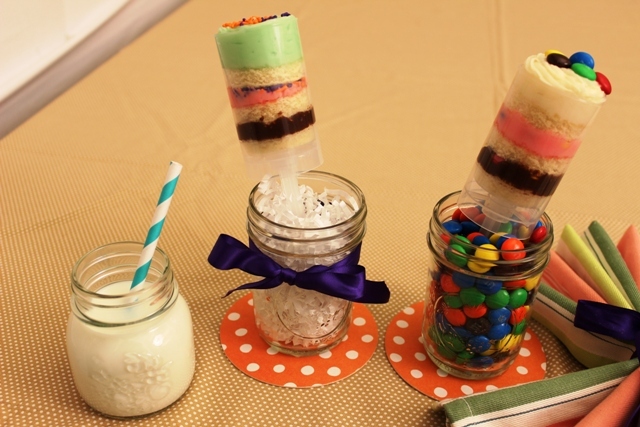 Start off each cake push-up pop by gently nudging one cake circle into the bottom of the container. Then, pipe a thin layer of the frosting of your choice right on top of the cake layer. Add a third layer of sprinkles or any other topping you prefer. Repeat step Nos. 3 and 4, adding layers in order until you’ve reached the top of the push-up pop container. Top off the final layer with any garnish of your liking. Grab a clear mason jar and tie a cute ribbon around the mouth of the jar. You can also use a drinking glass or a miniature bucket. Fill the jar with candy-covered chocolate, like M&M’s, or shredded paper filler. Stick one or two push-up pops into the jar. Create multiple jars and serve them to your guests. Coming up next week: frosted pancake sandwiches. This is one breakfast-dessert combo you sure don’t want to miss! 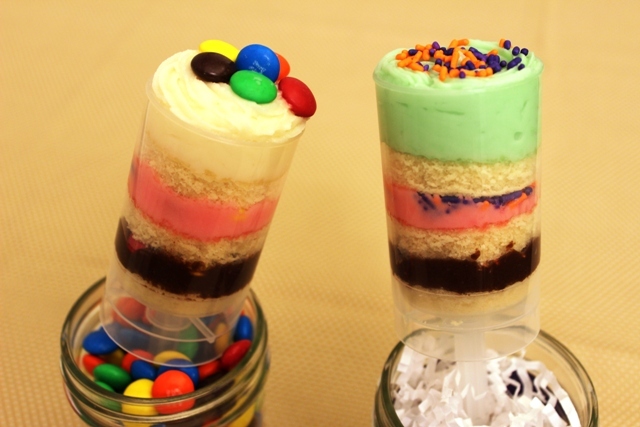 Until then, tell us about your creative ideas for cake push-up pops!